You are the focal point of elegance and chic in the zodiac. 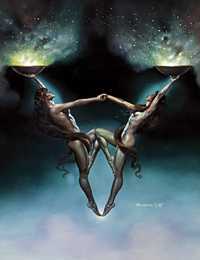 Ruled by Venus, the planet of love and sensual delight, you seek relationship with an avid fascination. Libra lives for love - and style! You are so much in love with love, you sometimes fail to notice how many admirers you are holding on a string... Charming Libra loves exploring every facet of relationship, being always on display and always on the lookout for Mr/Ms Right (even if already involved, love-loving Libra is ready to jump ship should something a little brighter appear on the horizon). Libra, a masculine (yang) sign, often seems contradictory. Ruled by Venus, the soul of love and sensuality, yet the exaltation of Saturn, the planet of high seriousness and lofty ambition, flirtatious Libra is likely to be attracted to or involved with more than one partner at a time. Because diplomatic Libra finds identity in relationship, you seek to harmonise yourself with your partner, even to the extent of adopting the other's interests and lifestyle. This can create strains in the event that one of your attractions is a conservative stock-broker and another a wild, edge-dwelling rock musician. Your creativity is primarily directed at shaping the relationship and generating the most exquisite accoutrements for the mating dance. You prefer to be the pursued, rather than the pursuing (unlike your opposite sign, Aries, who must be the hunter, and who loses interest should the game appear to be won). The more attention your mate pours upon you, the more you just lap it up. Indeed, should the attention become attenuated for any length of time, you'll quickly lose interest and gravitate towards a warmer flame. You have a reputation for being unable to make up your mind and easily led, but in the event you are thwarted, a sterner side can emerge, much to the surprise and consternation of the less finely attuned. Libra is a cardinal sign, so you are best involved with a special person who understands your need for romance and your search for the perfect environment. You are co-operative, imaginative and willing to experiment with all manner of relationship styles, although you can become furious should your foolish paramour seem to be attracted to someone who fails to meet your standards of dress. This has probably more to do with anger at self for failing to realise that your formerly admired paragon of taste has in reality no more chutzpah than last year's Lada.